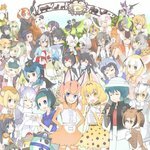 A Japanese media franchise about the fictional Japari Park where various animals were anthropomorphized into girls referred to as Friends. The game by Nexon was closed a few weeks before the anime aired. Despite the game being unsuccessful, the anime version was a surprise hit, receiving very high ratings and viewership.